by Mike Hawes, R&D Planning Manager for Automotive and Energy Solutions, Keysight Technologies, Inc. The latest news continues to support extensive investments and development in vehicle electrification as hybrid (HEV) and electric vehicle (EV) sales grow (Figure 1). 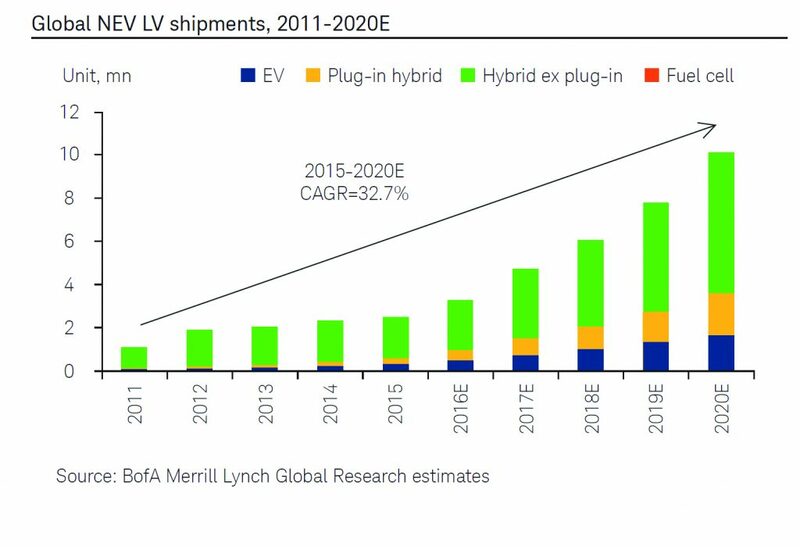 Some of the major market constraints for EV growth are being addressed by recent EV introductions from automotive OEMs. Tesla’s recently introduced Model 3 and Chevrolet’s Bolt both have ranges well over 200 miles, enabling many commuters to charge their EV almost exclusively from home. However, the industry is still not making profitable EVs and less than 1% of passenger cars on the road are EVs. Experience has shown that new powertrain technology typically takes more than one design cycle to turn a profit. 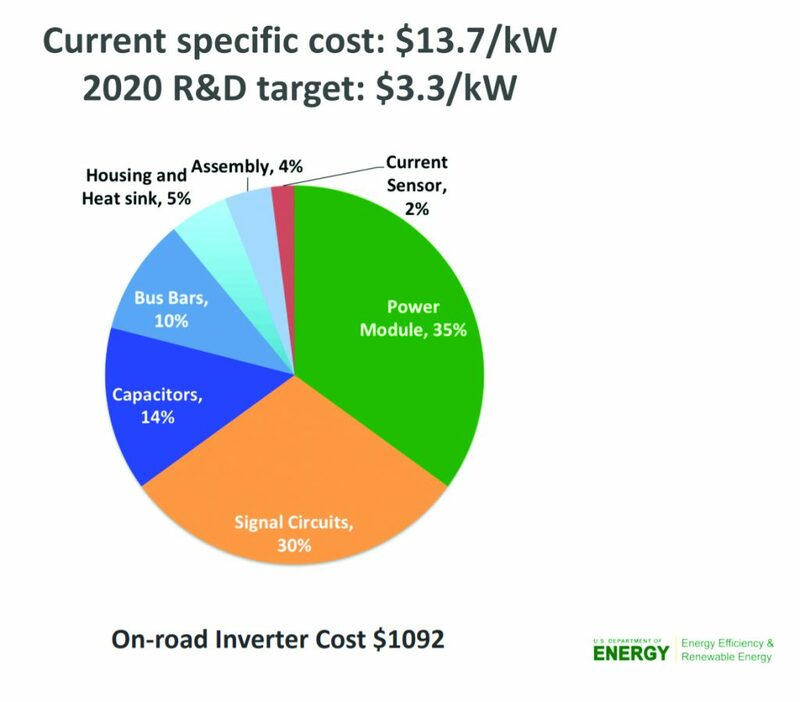 The extreme cost pressure on EV power train components (traction motors/inverters, DC/DC converters and batteries) continues to drive new fundamental technologies, including Wide Bandgap (WBG) semiconductors. Figure 2 highlights the extreme goals being targeted. HEVs and EVs have multiple architectural configurations. Figure 3 shows a simplified block diagram of a couple of architectures. For the strong (or parallel) hybrid and the pure EV (no engine), a high voltage (HV) boardnet is supplied by a large battery, which powers the electric powertrain. Power levels of the inverter and motor/generator range from ~50 kW up to and over 180 kW. Along with the large Li-Ion battery, a significant investment is required to develop these architectures. Most of the components support bidirectional power flow. When power flows from the battery to the inverter/motor, the vehicle is propelled. When decelerating, the momentum of the vehicle turns the generator, driving power back through the inverter and charges the battery (regenerative braking). Because of the power levels and heat dissipated, most power converters are water cooled, adding to the cost of the vehicle. In the Mild Hybrid (MH), the motor/generator, inverter, DC/DC converter and battery are all bidirectional. The inverter/motor is not large enough to drive the vehicle by itself (as in the HEV or EV), but instead is used to supplement the engine power during acceleration and recharge the battery during deceleration. This technology also uses a 48 V boardnet to reduce safety concerns and cost. Europe is heavily investing in MH technology, because the technology claims a reduction of up to 20-30% of CO2 for only 50% of the cost of a full hybrid vehicle1. The DC/DC buck converter is a key component in all HEV/EV architectures, converting the higher voltage boardnet (MH – 48 V or EV/HEV – 100s of V) to the traditional 12 V boardnet, from where most electrical loads are powered. Let’s investigate some of the impacts of industry trends on design and test of DC/DC converters. High Temperature Operation: The thermal conductivity and melting point of WBG devices enable them to operate at temperatures over 300°C, providing a more reliable solution for HEV/EV applications. Efficiency: Because WBG devices can switch much faster than Si, they reduce switching losses and the need to dissipate heat, while increasing efficiency. Additionally, higher frequency means smaller magnetics components, supporting a less costly design. High Voltage Operation: WBG devices can withstand high voltages (600 V and more). This enables a HV boardnet architecture to power HEV/EV components with less current (i.e. small diameter wires), reducing the weight of wire harnesses. Simulation of WBG design – The emergence of WBG devices in power converter design complicate the simulation and design of the DC/DC converter. Manufacturers of GaN and SiC devices are still getting their processes under control. Therefore, users need to characterize each WBG device to determine if it will work in their designs. 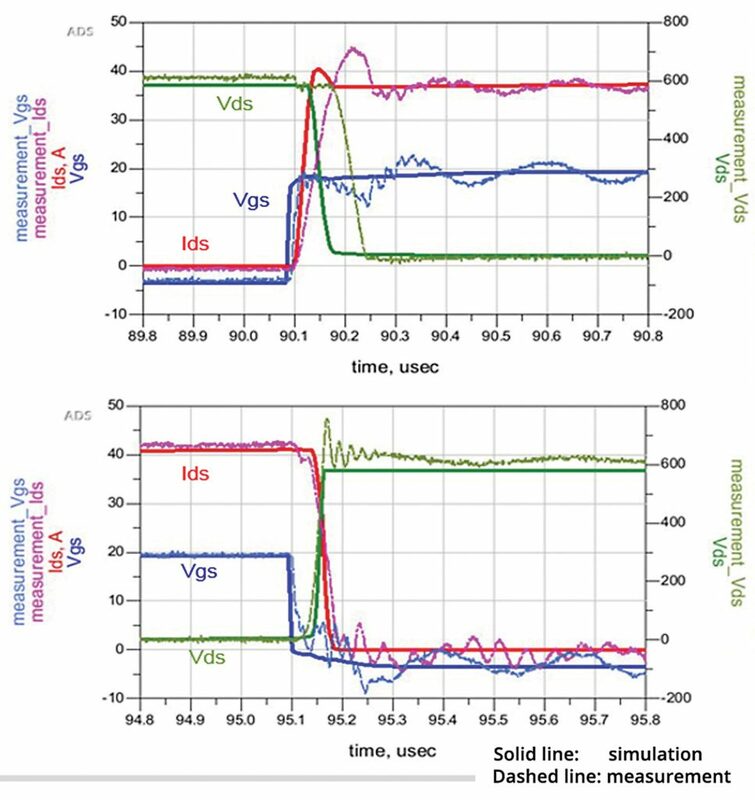 Additionally, because of the fast switching characteristics, conventional “lumped analysis” simulators don’t provide accurate representations of WBG power converter designs (see Figure 4). The conventional model/simulation shows a significant difference between simulated results (bold line) and measured results (faint line) when switching on and off the power transistor. The poor simulation creates costly design delays as designers go through many iterations of their designs. Additionally, safety concerns are more prevalent with unreliable simulation of high power circuits. Bi-directional Test – As more and more DC/DC converters become bidirectional, testing both directions of power flow requires test equipment that is capable of sourcing and sinking power to the DC/DC converter. This is traditionally accomplished by connecting a power supply and an electronic load in parallel. However, external circuitry (i.e. diode to stop current flow into the power supply) and cumbersome “two-instrument” programming, typically don’t allow for smooth signal transitions between sourcing and sinking power, reflecting an inaccurate simulation of the operating conditions. Electronic loads typically dissipate the power transferred to them from the DC/DC converter. However, this dissipated power (heat) can start to add up, especially for test applications where multiple DC/DC converters are testing in parallel. Because of the need to remove the heat from the electronic loads, they are often large with significant forced air (via fans) or potentially even water cooling. Safety Concerns – With the high power and voltage levels used with DC/DC converters, designers, technicians, and operators need to be careful when testing a converter. The input of the HEV/EV DC/DC converters are all over the 60 V safety limit, requiring special safety mechanisms (e.g. NFPA 79) in manufacturing. These safety standards require a redundant system. The redundant safety systems are often custom designed, using PLC logic to operate independently from the test system. This adds additional design, cost and complexity to the manufacturing test systems. There exist new test technologies and approaches to overcome the challenges described above, including new simulation techniques, regenerative loading, “two-quadrant” power systems and “commercial off the shelf” safety solutions. To find out more about these solutions, reference “Keysight Technologies: Emerging Solutions to Hybrid and Electric Vehicle DC/DC Converter Design and Test” whitepaper in our online library at www.keysight.com/find/ev1003a . With its recent acquisition of Scienlab, Keysight Technologies has expanded its test and measurement portfolio to serve the HEV/EV market even better. For more solutions, please visit: www.scienlab.com. 1) Techno Systems Research Co, J.P. Morgan, May 2016.